We’ve all had them, simple cuts and grazes are a common first aid problem. It’s important to know the correct first aid steps for small cuts and grazes. Although these wounds may appear small, they are at risk of infection if the wound is not cared for appropriately. 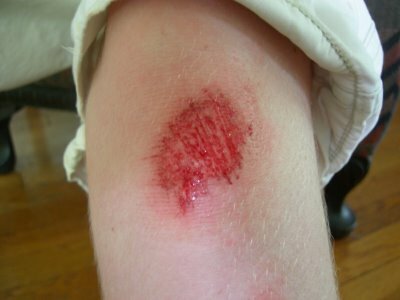 So what is the correct first aid treatment for a minor cut or a graze? Let’s take a closer look in this first aid blog post. Step 1: Stop any bleeding. You can elevate the wound and apply direct pressure using a sterile gauze swab/pad. If this does not stop the wound bleeding then seek urgent medical attention. Step 2: Throughly clean the wound using running water or antiseptic wipes. Dry with a sterile gauze swab/dressing. Step 4: Cover with a sterile dressing or plaster. Your main aim is to stop the wound becoming infected, so cleaning the area thoroughly is important. If you are unable to thoroughly clean the wound, or the wound is heavily contaminated with dirt or grit, then you should seek urgent medical attention. Do not attempt to scrub the wound with brushes or remove any large embedded objects. Infected wounds are often very red, swollen, painful and may have pus. As the infection develops the victim may develop a fever. If you see any of these signs you should seek medical advice urgently. 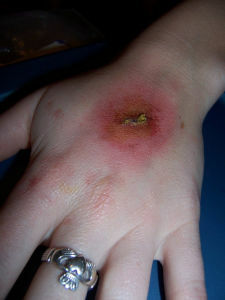 The photo below shows an example of an infected wound. One of the infection risks in any open wound is Tetanus. Tetanus is a rare infection caused by Clostridium tetani, a bacteria which lives in soil which can lead to muscle spasms, fever and sweating. There is an effective vaccine available for Tetanus, however not everyone has necessarily been vaccinated. If you’re unsure about a wound, always seek medical advice from a medical professional. Want to learn more about first aid? Why not take one of our free online first aid classes with free first aid certification! I have a feeling this is going to come in very handy for me. I have a nine year old son. He gets these cuts on him all the time. Of course, he’s all legs and arms and really skinny. So he bruises if he just so much as bumps into something. We never know where he gets any of his little scrapes and cuts. So this is good to know. Good to know with watching kids, never know when someone gets hurt!